GoGo Cleaning Ltd has been very busy with all the builders cleans after constructions and renovations going on in Bristol. 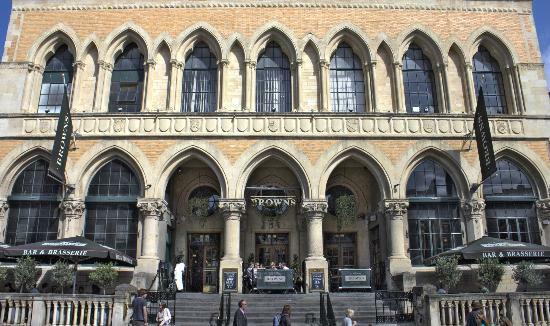 Browns restaurant on Park street right in the heart of Bristol is one of the prime example of that. A very well known social place for, local public and tourists like wise, went under some renovations recently and GoGo Cleaning Ltd was called in to carry out a builders clean at the premises. GoGo Cleaners were very efficient and completed the task effortlessly, as GoGo Cleaning Ltd do for all the projects. GoGo Cleaning Ltd was called in by Trios Group, who were very happy with GoGo Cleaners cleaning. The clean included bathroom cleaning, bar to be thoroughly cleaned, seating area and the high ceiling ornaments. Bar clean mostly included brass work to be cleaned, which GoGo Cleaning Ltd’s highly trained cleaners cleaned and buffed exceptionally well. As most of you all are aware of how high the ceiling in Browns Restaurant is, GoGo Cleaning allocated its highly qualified cleaner to clean all the fans, lightings and windows, resulting in high standard cleaning. As this was a construction site, all cleaners that were at the job had CSCS cards and personal protective equipments.